Hypothyroidism and Hyperthyroidism are becoming very common nowdays. As the population is increasing, number of diseases and their types are also increasing. Ayurveda is the best way to cure a disease along with medicines, diet & home remedies also play a vital role. Hypothyroidism is a common disorder caused by underactivity of thyroid gland. When our thyroid gland is not able to produce enough thyroid hormone it leads to Hypothyroidism. Women that are more than 60 years of age are more prone to this disease. Hypothyroidism creates many health issues like joint pain, obesity, heart diseases and infertility. Autoimmune disease like Hashimoto’s is the most common cause of Hypothyroidism. In some cases, treatment of hyperthyroidism can result in permanent hypothyroidism. Sometimes, thyroid surgery can be a reason for hypothyroidism. Radiation used to treat cancers of neck and head can affect thyroid gland that might lead to hypothyroidism. Medications like lithium can contribute to hypothyroidism. Blood Test: When your T4 levels are lower than the normal levels it signifies Hypothyroidism. Sometimes TSH levels increases and T4 level is normal it shows mild Hypothyroidism or early stage of Hypothyroidism. Ultrasound of Thyroid Gland: It will show the abnormality of thyroid gland. Thyroid Scan: This scan will check nodules and inflammation of thyroid gland. The patients dealing with this problem should eat vegetables like bitter gourd, bottle gourd, ridge gourd, garlic, carrot, cucumber, sweet potatoes, tomatoes, lentil, potatoes, ginger, parsley, onion, beans, beetroot, fenugreek leaves and eggplant etc. Vegetables that should be avoided are broccoli, cabbage, cauliflower, kale, brussel sprouts, mustard green, radish, spinach, turnip and soybeans etc. Fruits that should be consumed are apple, banana, papaya, watermelon, muskmelon, pineapple, avocado, mangoes, strawberries, cherries, pear, plum and peaches etc. Consumption of spices like cinnamon, mint, nutmeg, fenugreek, turmeric, coriander, cumin, cloves, pepper, & curry leaves is benficial. They must avoid spices like excess table salt and red chilies. Other products that should be avoided by Hypothyroidism patients are broccoli, cabbage, barley, rye, white flour, cheese, butter and fast food. Ayurvedic treatment is the best way to cure hypothyroidism and its associated symptoms. The herbs used, show very effective results and cause no side-effect to the body. 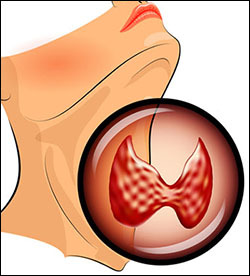 Planet Ayurveda offers some group of herbs that are good for Hypothyroidism. Pure extract of Gotukola "Centella asiatica" herb is used for the preparation of this capsule. This capsule provides effective results in nervous exhaustion, stress, anxiety, lack of concentration and weak immunity associated with hypothyroidism. 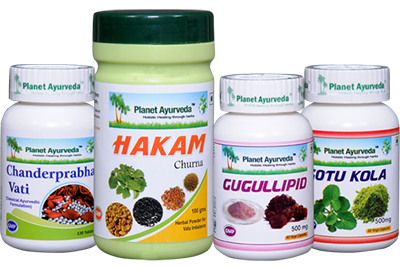 The ingredients used for the preparation of these tablets are Guggul (Commiphora mukul), Karpoor (Cinnamomum camphora), Vacha (Acorus calamus), Mustak (Cyprus rotundus), Haridra (Curcuma longa), Amalaki (Emblica officinalis), Chavya (Piper chaba), Guduchi (Tinospora cordifolia) and Vidanga (Embelia ribes) etc. These herbs exert calming effects on the body, helps to lose weight, overcomes weakness, builds stamina and strengthens and eliminates toxins from the body. It helps to overcome all symptoms related with Hypothyroidism. These capsules are prepared from the extract of Guggul resin (Commiphora mukul), Dalchini (Cinnamomum zeylanicum), Bhumi amla (Phyllanthus niruri), Sonth (Zingiber officinale), Marich (Piper nigrum) and Pippali (Piper longum). It helps to remove toxins from the body, rejuvenate health, controls cholesterol, triglycerides and various other health issues. The herbs used for preparation of this churna are Chandershoor (Lepidium sativum), Kalonji (Nigella sativa), Methi (Trigonella foenum graceum) and Ajwain (Trachyspermum ammi). It helps to improve digestive fire, relieves bodyache, stiff joints, stiffness, depression, constipation and other associated symptoms related with hypothyroidism. Here are some home remedies that will help you to cure Hypothyroidism easily at home. Use these remedies as it will not have any side-effects on your body. Apple cider Vinegar: This is one of the best remedy for Hypothyroidism as it will help in detoxification, weight loss, improves metabolism and regulate hormones. Usage: Take one tablespoon of apple cider vinegar in a glass of warm water and drink this water regularly. Ginger: It has anti-inflammatory properties and improves thyroid functioning. Usage: Take few slices of ginger. Boil it in two cups of water until it remain to one cup. Strain this and drink this herbal tea once daily. Coconut Oil: It is a very powerful home remedy. This oil will reduce inflammation, pain and maintain metabolism in body. Usage: Include coconut oil in your diet as it will improve your condition. Flaxseeds: These seeds will stimulate production of thyroid hormone, increases energy in body and treats hypothyroidism easily. Usage: Consume one teaspoon of flaxseeds early in the morning on an empty stomach with a glass of water. Coconut Milk: It helps to restore normal functioning of thyroid gland and increase metabolism of the body. Usage: Take two tablespoon of coconut milk add it to a glass of milk and drink this milk once daily. You can also add this milk in cooking. Add Vitamin B-12 to your diet as it will reduce fatigue that is caused in hypothyroidism. You should include peas, asparagus, milk, sesame seeds and eggs to your diet. Eat a healthy diet.